As a reading child, growing up in both former Soviet Ukraine and independent Ukraine, I was kindled by children’s books that told stories from other countries. I read about many interesting places, and was open and excited to visit countries not only to see and learn about places and people, but also to share something from or about my country. When I came to the U. S. for the first time, I brought souvenirs from Ukraine in order to represent a multifaceted culture of my country. I have been living in this country for about ten years now, and I am still bringing some souvenirs to and from Ukraine while going back and forth between here and there. However, these souvenirs have now turned into books—mostly children’s books to be exact. As an adult PhD student, I grew even more interested in international books, but became puzzled when I found out that my country was represented only by Jan Brett’s interpretation of a Ukrainian folktale, The Mitten. I was surprised that many other countries are also underrepresented through a children’s literature perspective. 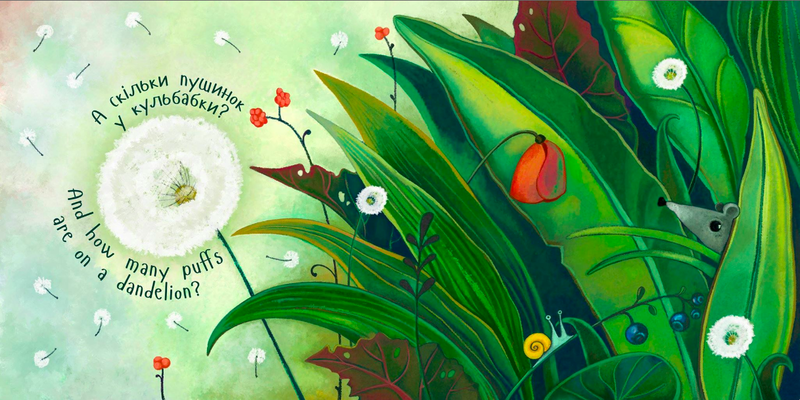 While my academic focus is the inclusion of international children’s literature into U. S. classrooms, I also care about the representation of Ukrainian children’s literature in the U. S. But the question is: how can I bring it to U. S. readers? The stepping stones that I envision to follow my beliefs include reviewing international books for children in both English and Ukrainian, translating children’s literature from Ukraine, writing about it for both IBBY and USBBY organizations, and finally trying to launch a joint project with a small private publishing house, Bratske Publishers, located in Ukraine. I am also sending samples of Ukrainian children’s books in translation to publishers in the U. S. Canada, New Zealand, and Great Britain. 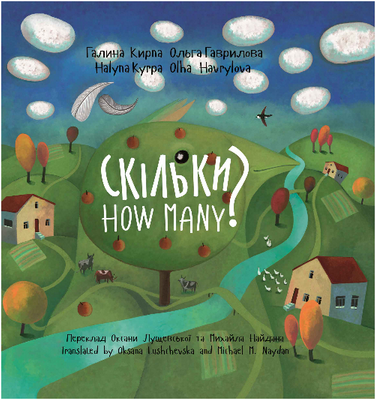 Since I came from Ukraine just a few months ago and brought a number of copies of a bilingual picturebook Скільки?/How many? by Halyna Kyrpa and Olha Havrylova, published by Bratske Publishers, I want to share its story, since the creation of a book always has a story behind its physical artifact. The first motivation for this project was a graduate course, International Children’s Literature, taught by my academic adviser, Dr. Jennifer M. Graff. The second one was the question asked by my doctoral colleagues: what can we do to bring to young readers the books from the countries that are not widely represented or underrepresented in the U. S.? The third, and by far the most important one, involves the turmoil and tragic events that are currently happening in my country. A year ago, Ukraine became a country in which huge strives for social justice and societal, cultural, and economic stability were vitally pulsing. In addition, Russia started the war in Ukraine soon after the Revolution of Dignity took place. At this time, we, the students of international children’s literature course, read Jella Lepman’s (1891-1970) book, Bridge of Children’s Books: The Inspiring Autobiography of a Remarkable Woman. Oksana and others read Скільки?/How many? Lepman was the founder of the International Youth Library in Munich in 1949, and she strongly believed that children’s books are a key to “peaceful coexistence…all over the globe,” and children’s books might help us to raise renewed generations in the world by globally showing and emphasizing the best examples of humanity through the art of children’s books. Books can expand the understanding of global connections and evoke an interest to learn about each other in compassionate ways in order to become global citizens. Put in Lepman’s words, children’s literature “affords a wide view of differences and similarities in the children’s literature of various nations, it also vividly shows the mutual influence they depend on” (p. 54). With this idea in mind, I considered ways of representing Ukrainian children’s literature beyond the borders of Ukraine. At the same time, I strived to bring another story of my country: the one that shows that despite the war and turmoil, the Ukrainian desire for change has a huge cultural impact. Yet, the news coverage, as we know, often represents only a tiny fraction of the things happening in a cultural and social life of a country. Thus, the creation of this bilingual picturebook was another story, a story with its own voice. An initial step of the creation of this picturebook was to formulate an idea and its format. I found out that Kickstarter provides a fairly simple, yet specialized enough platform to start such a project. My friend, Ian Boucher, helped me with the video, and my colleague, Stephanie Maria Short, helped me with editing the text of the promotion page. My Ukrainian colleagues and friends, Yuliya Berezenko, a gifted editor and a founder of Bratske Publishers, and Valentyna Vzdulska, an unparalleled editor and children’s book writer, supported me with translation of the information and distribution of it among potential supporters. It was difficult to believe that we would reach a needed sum of money to start the project, but my colleagues, professors, and the members of Ukrainian communities both in Ukraine and in the U. S. supported this project with great enthusiasm. I am deeply thankful for their tremendous encouragement and support. They made the project possible. When we saw that we were about to reach our goal, I started to work on the translation of the text. I have to admit that it was not an easy task to find a right text. We wanted to publish something that would represent an experienced voice on an author, provide fruitful elements for an illustrator, and finally serve as both globally and culturally-conscious literature. “Скільки у сонця промінчиків? / How many rays does the sun have? А скільки хмарок у небі? / And how many clouds are in the sky? А скільки піщинок на березі річки? / How many grains of sand are there on a riverbank? The artist, Olha Havrylova, started to illustrate Скільки?/How Many? right after the translation was done and approved. It took approximately four months of daily work to finish the illustrations. During the process, we checked and discussed each illustration, commented on colors, and tried to document each important step on Kickstarter. It was a challenging and interesting process that might only be learned through experience. When the book was sent to the printing house, another situation emerged. The picturebook came out with some unexpected surprise: the colors turned out to be much darker than we anticipated. We needed to place an order again, to check each book and revisit our expectations. Another story is a promotional campaign. First, the book was presented at the Lviv Book Forum, the largest literary forum in Ukraine, and finally found its way to the readers. While in Ukraine, I visited about four reading events, and upon my return to the U. S., I also had a chance to read the book to kids in one of the local schools and as a guest visitor at Avid, Athens, Georgia’s local bookstore. Oksana reads Скільки?/How many? with children and their families in Ukraine. Based on my observations, children and adults responded to the book with great interest. They enjoyed listening to the poem, counting the objects in the illustrations. They picked up new words and phrases easily, and were ready to talk about the philosophical questions raised in the picturebook. They also participated in an interactive game, which I called “A Translator.” They tasted foreign words and repeated them with excitement. 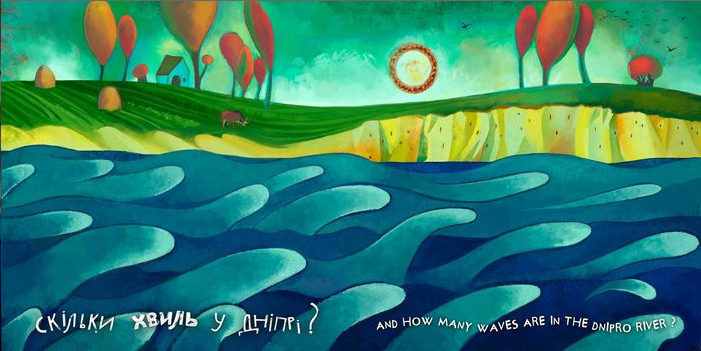 In a nutshell, I am proud to inform our readers that due to the efforts of many children’s literature enthusiasts and supporters, the picturebook, Скільки?/How many? is now available in Avid Bookshop, Homeplace Gifts, and on Amazon in both picturebook and e-book formats. While looking back at the path we took, I believe it showed me how to answer the question that was simmering in our classroom that day: what can we do to bring to young readers the books from countries not widely represented—or underrepresented—in the U. S.? I think that we can show initiative, share our beliefs, and use all the possibilities that digital media provides to us. We can also devote our personal time to the ideas that fill us, and to the questions that don’t necessarily evoke right and straightforward answers. We need to experience and learn from that experience. We need to believe that we can do more than we think, and if even sometimes it sounds emotional, it still worth trying. Now, as the picturebook How many?/ Скільки? has been out for several months, and we have already started to work on our second bilingual picturebook, I think that there are so many steps behind us and so many steps ahead. 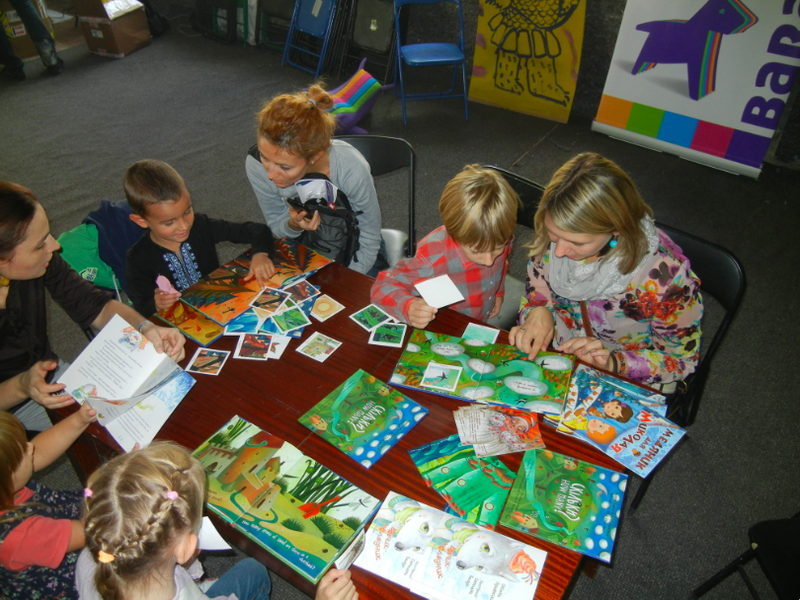 I strive to introduce bilingual picturebooks to publishing houses that are interested in international titles for children because I believe that Ukrainian-English picturebooks might bring about many possibilities and provide advantages to learn from and about Ukrainian children’s literature in order to familiarize readers with the Ukrainian language, and to use this literature in worldwide educational academic and school settings. Additionally, such bilingual picturebooks will expand literary responses and discussions, as well as could help to develop and strengthen students’ identities, histories, and imaginations that are at the core of literacy practices. 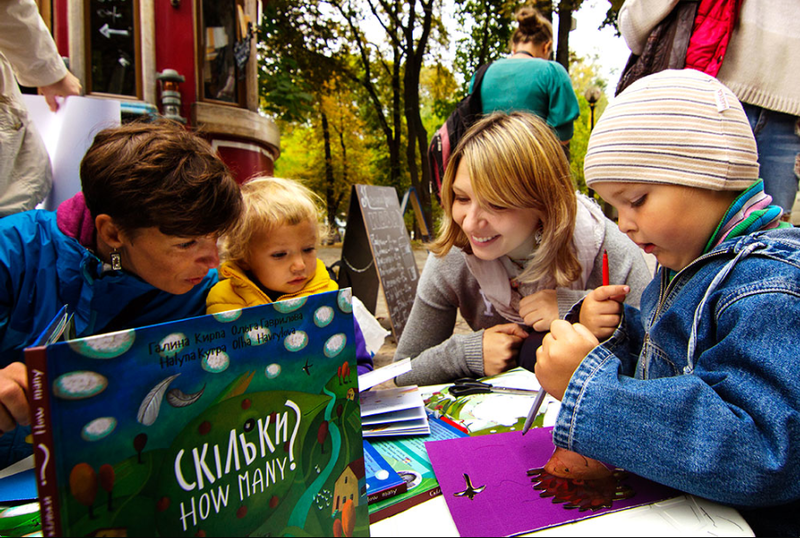 I have hope that the bilingual picturebooks that we are working on will find their way to children’s literature enthusiasts, and will lead us to see more examples of children’s literature from Ukraine, as well as many countries that still need wider and deeper multifaceted representations for classroom reading and discussions, and for a great reading enjoyment. Lepman, J. (2002). A bridge of children’s books: The inspiring autobiography of a remarkable woman. Dublin, Ireland: The O’Brien Press, Ltd.
Oksana Lushchevska completed a Master’s degree in Russian and Comparative Literature, and a Graduate Certificate in Children’s Literature from the Pennsylvania State University. She is currently a doctoral student at the University of Georgia, studying children’s literature. She is an author and translator of children’s books written in Ukrainian.